I'm happy to be able to give you a Christmas gift: A Nutcracker Unit Study. We are using this over the next two weeks in our homeschool. My children are 11 and 8. I've created activities for the younger children and for middle grades. This is just some of what is included in this study. My children have already been working... 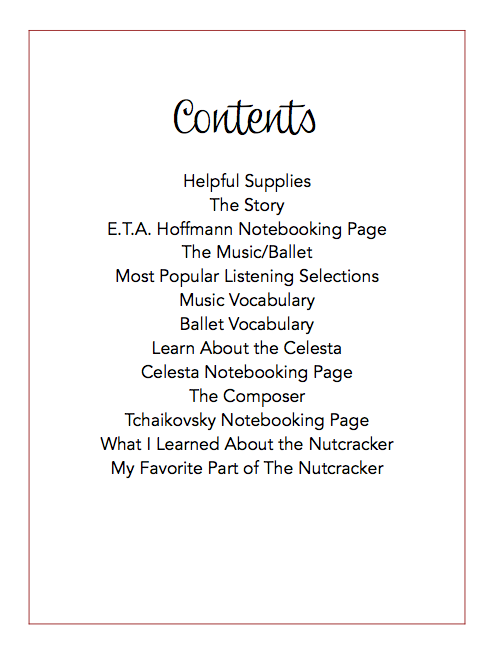 I especially love the Nutcracker drawing tutorial and the notebooking pages. I hope you enjoy this unit study! Nothing does my heart more good than to hear my children humming Tchaikovsky's music, or excitedly chattering with each other about their favorite parts of the ballet. Music is a gift that last a lifetime. Give this gift to your children this holiday season. Purchase The Nutcracker Unit Study today. Immediately after your purchase at eJunkie with Paypal, you will receive a link where you may download the Nutcracker Unit Study immediately. You may save it to your computer as a PDF file. You can easily use this file on your computer, tablet, or eReader. Buy Now - just $3.99!